Offering direct access to the beach, this Pejarakan hotel is within 3 mi (5 km) of Banyuwedang Hot Spring Water and Nature Conservation Forum Putri Menjangan. West Bali National Park and Reef Seen Turtle Hatchery are also within 9 mi (15 km). Located in Pejarakan, this beachfront hotel is in a national park, 1 mi (1.6 km) from Banyuwedang Hot Spring Water, and 2.5 mi (4.1 km) from Nature Conservation Forum Putri Menjangan. Pemuteran Beach and Menjangan Bay are also within 9 mi (15 km). 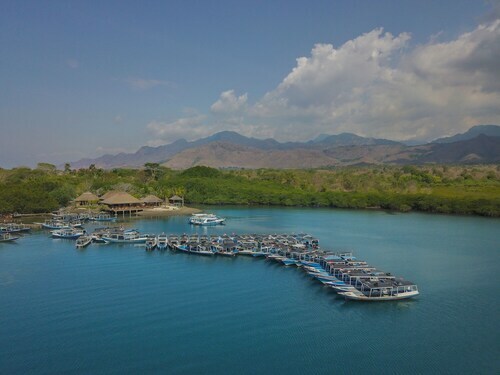 Located in Pejarakan, this beachfront resort is in a national park, 1.2 mi (1.9 km) from Menjangan Bay, and 2 mi (3.2 km) from West Bali National Park. Banyuwedang Hot Spring Water and Nature Conservation Forum Putri Menjangan are also within 6 mi (10 km). Situated near the bay, this spa hotel is 0.1 mi (0.1 km) from Banyuwedang Hot Spring Water and 2.1 mi (3.5 km) from Nature Conservation Forum Putri Menjangan. West Bali National Park and Menjangan Bay are also within 6 mi (10 km). 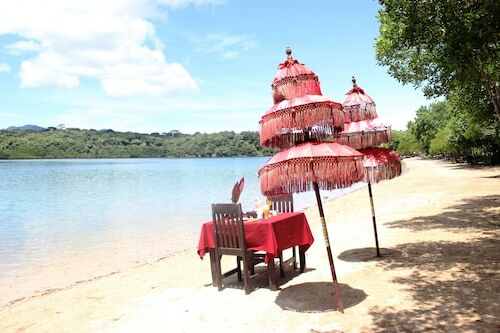 Nestled on the beach, this Pejarakan hotel is 0.6 mi (1 km) from Menjangan Bay and 3 mi (4.8 km) from West Bali National Park. Banyuwedang Hot Spring Water and Nature Conservation Forum Putri Menjangan are also within 9 mi (15 km). If you're planning a trip to Pejarakan and trying to find somewhere to stay, you'll have a good selection of hotels to choose from. Book any of the 4 within 5 kilometres of the city centre. 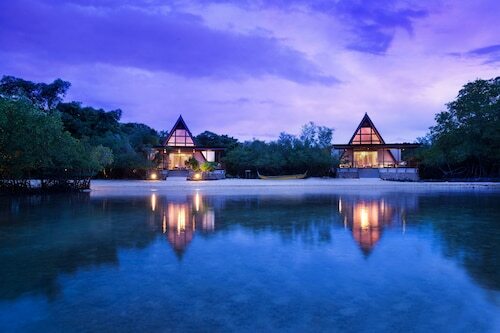 Try to take a look at The Menjangan and Naya Gawana Resort & Spa. All these places are not far from the main areas. If you find yourself searching for more accommodation options in Pejarakan, try the Matahari Beach Resort & Spa and the Amertha Bali Villas Beach Front Resort and Spa. They are located 10 kilometres and 9 kilometres away from the city's main streets. 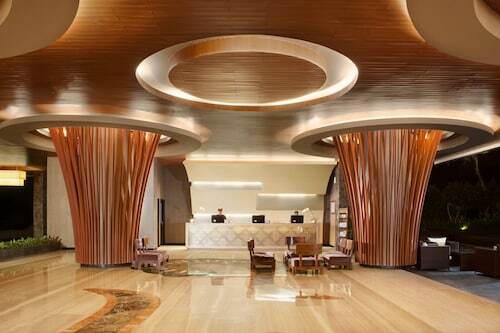 Wotif also suggests the NusaBay Menjangan by WHM and the Taman Sari Bali Resort & Spa. The first is 7 kilometres away from the city, while the second is 9 kilometres away. The nearby cities of Pekutatan and Gobleg are definitely worth seeing. Pekutatan is 45 kilometres to the southeast of Pejarakan, while Gobleg is 55 kilometres to the east. 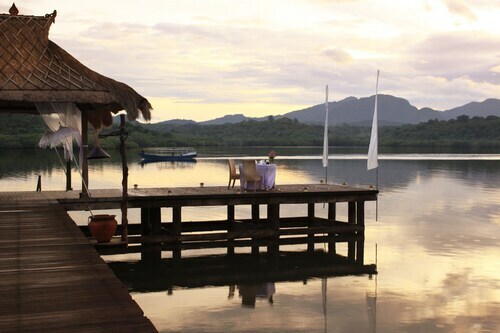 Accommodations in Pekutatan include the Kelapa Retreat & Spa and Medewi Bay Retreat. Gobleg choices include the Munduk Moding Plantation and Puri Lumbung Cottages. If you're transiting into or out of Ngurah Rai International Airport and plan to stay nearby, check out the latest deals at the Four Seasons Resort Bali at Jimbaran Bay or the Temple Hill Residence Villa. How Much is a Hotel Room in Pejarakan? Hotels in Pejarakan start at AU$74 per night. Prices and availability subject to change. Additional terms may apply.